The fine tradition of hard-boiling and dyeing chicken eggs every Easter can be adapted for the avid BBQer. Not only will this give you a fully cooked egg, but it will have the richness of barbeque smoke, a luxurious brown hue, and it all happens in one step instead of two. First, set up your Weber 22″ grill for indirect low temperature cooking / smoking. 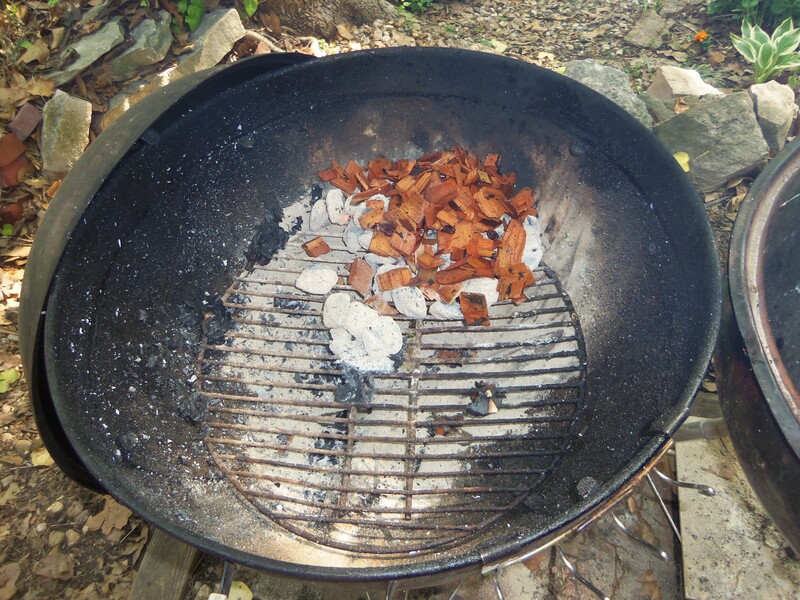 I added about a quart of water-soaked cherry wood chips to about a third of a coal starter chimney’s worth of charcoal. 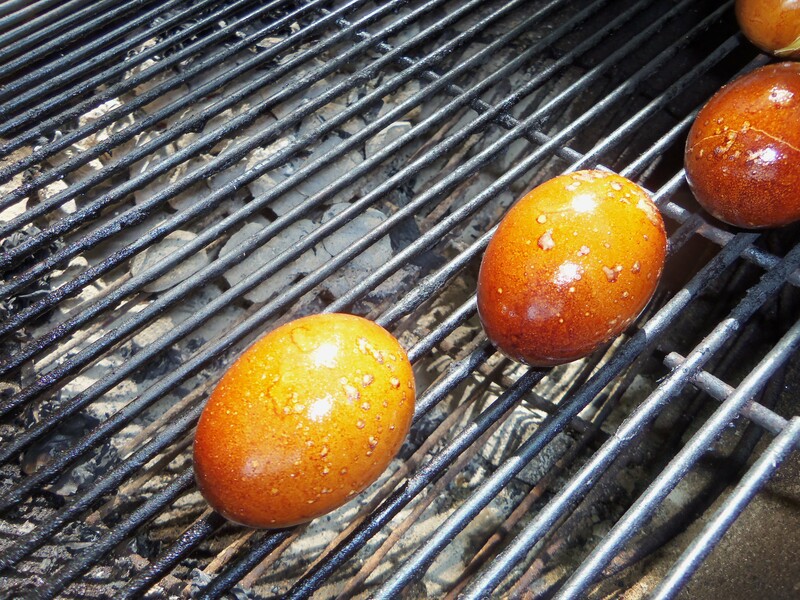 Simply enough, the eggs go right on the grill grate over indirect heat. 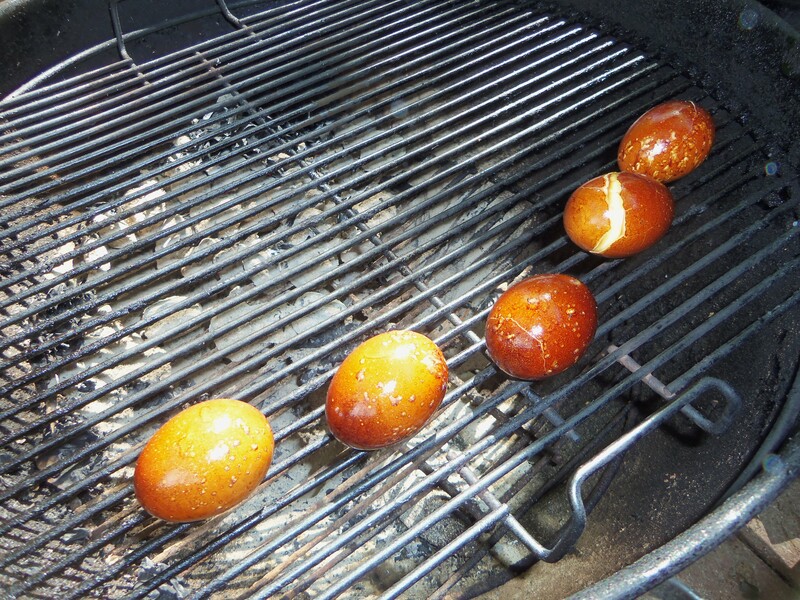 Be sure to put the longer diameter of the eggs in line parallel with the grill grate openings, lest these things roll away. Put the vent over the eggs and walk away for about an hour. After a hearty smoking, each has a pretty brown coating. A couple have burst, but all are relatively intact, and each has cooked through all the way. 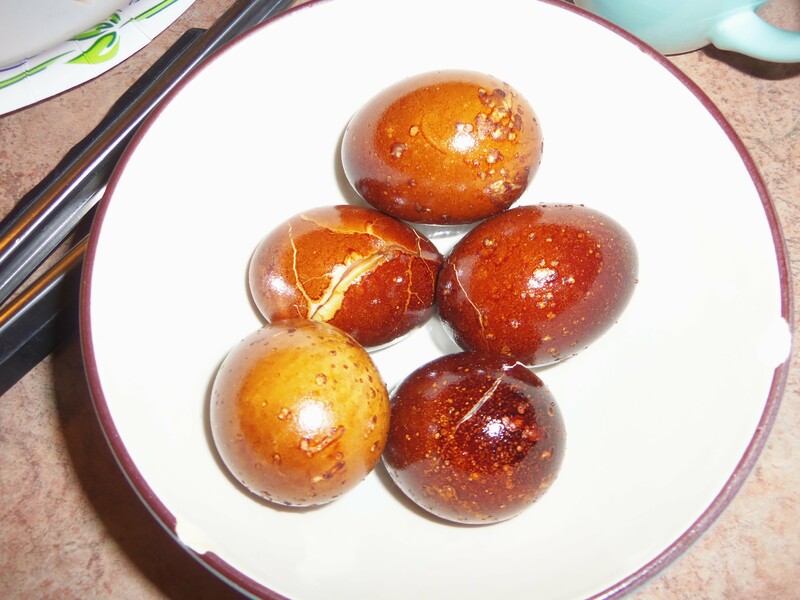 Each egg has a unique pattern of white speckles and ribbons of varying shades of brown, yellow, and amber. It’s both random and remarkable. Right of off the grill, removed gently with tongs, these make a luscious snack. It’s rich, flavorful, and (if you skip the yolk) it’s nearly cholesterol-free pure BBQ protein. 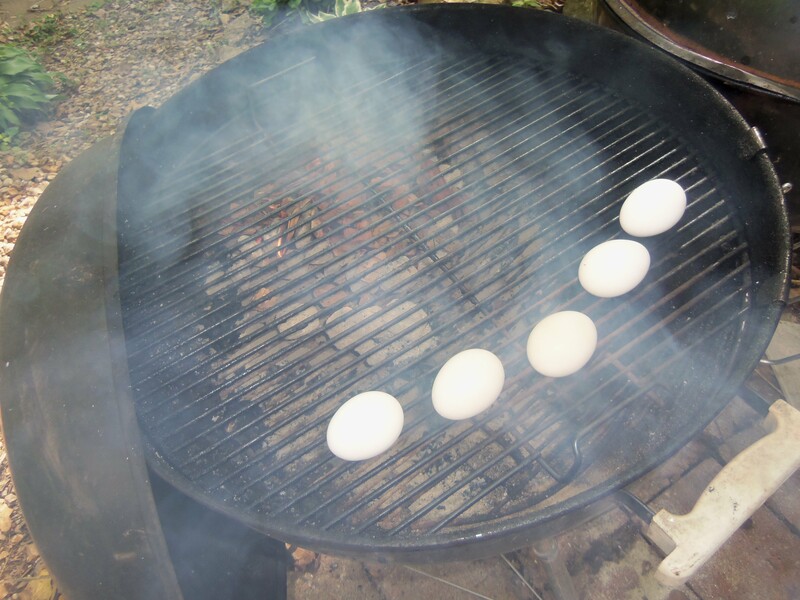 The smoke fully cooks each egg. There are two membranes that the smoke and flavor must penetrate, the first of which obviously being the hard outer shell. Underneath is the second, a more flexible membrane that separates the egg white from the shell. If you carefully peel the shell, you can rub off the second inner membrane to reveal the perfectly cooked egg white. 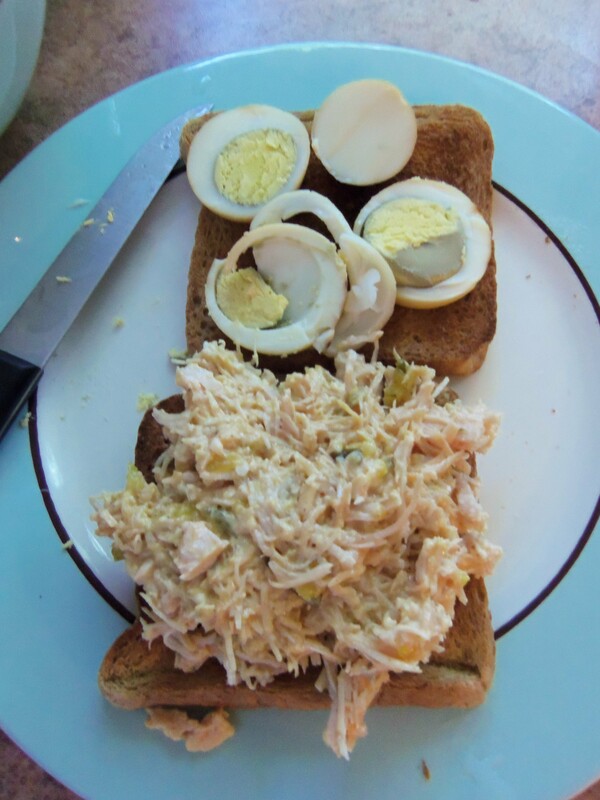 I sliced one up and put it on a chicken salad sandwich for lunch. The wife declined. Her only concern: “Those had better not give you bad gas later on.” Duly noted. What a wonderful way to celebrate Easter and the BBQ. If you like super-easy BBQ recipes that make heart-healthy, smoke-flavored food, then this is a great option for you. I washed it down with some of the Old Style that I bought for my dad for Easter dinner.